The word might seem to be pretty common but not everyone is aware of the real meaning of it. It’s not only about bringing in more sales, improve search engine rankings or increasing the click-through rates. The story goes beyond! There is No doubt, get more followers on Twitter and scheduling posts for the best time to get more organic exposures will undoubtedly increase your marketing reserves and should be in your daily routine and that’s a big part of digital marketing, but it doesn’t end there. Of course, you can’t expect a hi-fi return on your financial investment right away with this approach. However, spreading the word about your business will benefit you in the long run. With that, you can very easily turn leads into potential sales or referrals which can help to get some solid bucks in your pocket. Is your digital marketing campaign serving the same purpose? If not, you can act a bit strategically to include some fantastic ideas for boosting up your brand’s identity like never before. Here, in this piece of writing, there’s a comprehensive depiction of such exceptional digital marketing tricks. When it comes to the best digital marketing strategies for brands, publishing your business blog can be the most reliable source of expression and authenticity. In fact, it can turn out to be one of the most crucial social media ideas when you share your blog in the right and relevant social platforms. Of course, people trust blogs and they find it the correct approach to foster a new relationship with unknown brands. Eventually, they become leads and then customers. It is one of the best approaches to develop the know, like, and build factor which can be considered as one of the best ingredients of any digital marketing success. Hence, first take a step towards curating premium quality content relevant to your business and publish them in your website to attract abundant traffic. Social media is, of course, one of the best digital marketing strategies to promote your business and increase the awareness level. The social media ideas in case of digital marketing have always proven to be effective enough. There are almost 3 billion active users on social media and one-third of millennials prefer to opt for such buzzing platforms to communicate with the businesses. Hence, be active on Facebook, Twitter, Instagram etc. as much as you can, market your products or services rightly and let the name of your brand get absolutely viral. Just make sure that you’ve opted for the best-suited platform for your business. If Twitter seems to be the right one for your business, the following tweet quotation will be really helpful. As they say, content is the king! As per the latest algorithms of Google, content is getting a huge importance. Hence, content optimization in SEO is one of the most vital things to do now for digital marketers. You need to make the contents present on your website to become more and more attractive, useful, and actionable for the users. To right fixes and improvements in technical performance at the right moment is much expected. With that, you can certainly end up ranking your business in the top of the search engine all the time. Irrespective of what genre your website belongs to, videos are always extremely compelling to attract customer’s attention. With appealing videos being promoted, you can bring a huge extent of authenticity to your content. People will be able to explore the culture and personality of your brand like never before. Nowadays, customers look for nothing but the transparency in brands. The more you will become relatable to them, the more they will like you. With videos, you can build that trust fast as the audience would be able to connect in a better way. Retargeting ads is one of the latest and unique approaches to boost up your business. It is actually a paid strategy where you need to place a tracking code on your website. Further, it will send a tracking cookie on the browsers of your visitors. Finally, you will find your ad content following them everywhere they go online. The statistics have shown that almost 70% of the people who abandon your website never end up returning back again. Here, using retargeting ads could be a smart idea. It will help your brand to be in the top of your customer’s mind. Finally, their chances of returning back increase exponentially. How to use such ads? Place a retargeting pixel on either some specific sections of your site or the entire website. Measure the results in terms of click-through conversions, view-through conversions etc. Isn’t it a really effective digital marketing idea to remember? There is a wide array of SEO audit tools and a myriad of smart software available out there which can let your brand go digitally strong. However, following the excellent digital marketing ideas is crucial. Out of all of them, the aforementioned are some of the most popular ones. Haven’t you opted for them to skyrocket your business? Do it now and relish the fantastic results in no time! Arina Thoggy is the content developer at Blurbpointmedia.com. She is passionate about money savings, investment and children psychology, and relationship. In addition, Arina also supports non-profit agencies that provide health-care solutions to handicapped and disabled people. Netanel Baruch, an Online Marketer at Commun.it - after 3 years as a business owner as a Wedding planner, join to the worlds’ entrepreneurship with a passion for marketing and especially for content marketing. 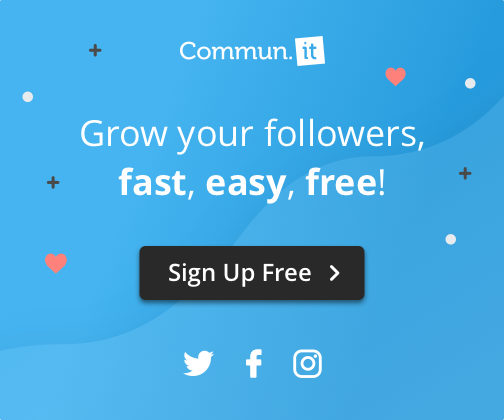 Managing the marketing activity of Commun.it, and our community on Twitter. If you have a crazy idea of how to cooperation, feel free to share with me. How To Find Top Trending #Hashtags?